While we were strolling the Chester Christmas Market we reached a point where we both stopped in awe. "Do you see that?" I asked John. "I certainly do!" Imagine my surprise when I realised I was looking at the Chester Cathedral while John was looking at.. This succulent, roasting pig. I finally clued in when he added, "it smells delicious"! Slipping my arm through his ;-) we headed toward the Cathedral. It began as a Benedictine abbey in 1092 and was built in the Norman style. 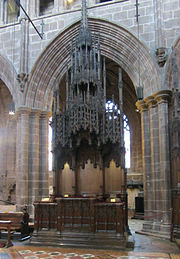 However around 1250 it was rebuilt in the Gothic style. The ornate wooden screen that separates the congregation from the choir. Turning around this is the view back to the main entrance. To the left is the cathedra or bishop's chair and the origin of why these churches are called cathedrals. This is a better photo courtesy of Wikipedia. 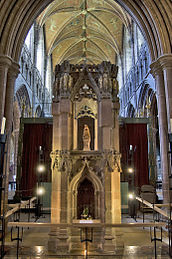 Also in this cathedral is a shrine to St. Werburgh (photo also courtesy of Wikipedia). We first became aware of her in Manchester as the tram station closest to our housesit was dedicated to her memory. The Grosvenor Museum is located within the city walls and well worth a visit for anyone interested in Chester's history. We were unaware of the relationship between Chester and the Grosvenor family until we took the Chester Heritage Tour. There we learned the Duke of Westminster is Britain's wealthiest man, that his title and lineage dates back to William the Conqueror and his son, Earl Hugh Grosvenor is one of seven godparents to William and Kate's Prince George. I was hoping to glean more information on the family at the museum, but other than bearing their name they were conspicuously absent. Still, I enjoyed the exhibits. There were three rooms dedicated to local paintings and sculptures. The Roman tombstones, however, were our favourite. The wealth of information recorded on these stones gives great insight into what their daily lives were like and two videos added more to make the original Roman settlement at Chester come alive. We thoroughly enjoyed our visit to Chester...but sadly John missed out on that roast pork delicacy!